This entry was posted on Wednesday, November 24th, 2010 at 11:58 am and is filed under Diamond Way Buddhism, Diamond Way Quote. You can follow any responses to this entry through the RSS 2.0 feed. You can leave a response, or trackback from your own site. Thank you for all the wonderful posts. I have a question however: What does it mean for the Mandala to be fully established? A mandala is called “kyil khor” in Tibetan, which translates as “centre and surrounding” and it refers to a buddha aspect, together with its surrounding environment. A free translation is “powerfield”. The Guru Yoga practice of the 2nd Karmapa, Karma Pakshi, was envisioned by the Great Tertön, Mingyur Dorje (1645-1667). When Mingyur Dorje was meditating on the protector Black Coat (Tib. Mahakala Bernakchen), in a pure vision the mandala of Karma Pakshi (pictured above) vividly appeared. The central figure was Karma Pakshi. Seated above Karma Pakshi’s head was Guru Rinpoche (Skt. Padmasambhava). To Karma Pakshi’s right was Horse Head (Skt. Hayagriva); to his left, Red Wisdom (Skt. Vajravarahi). Behind Karma Pakshi was Rechungpa (the great yogi Milarepa’s “moon-like” student). In front of Karma Pakshi was the protector Black Coat together with his retinue. 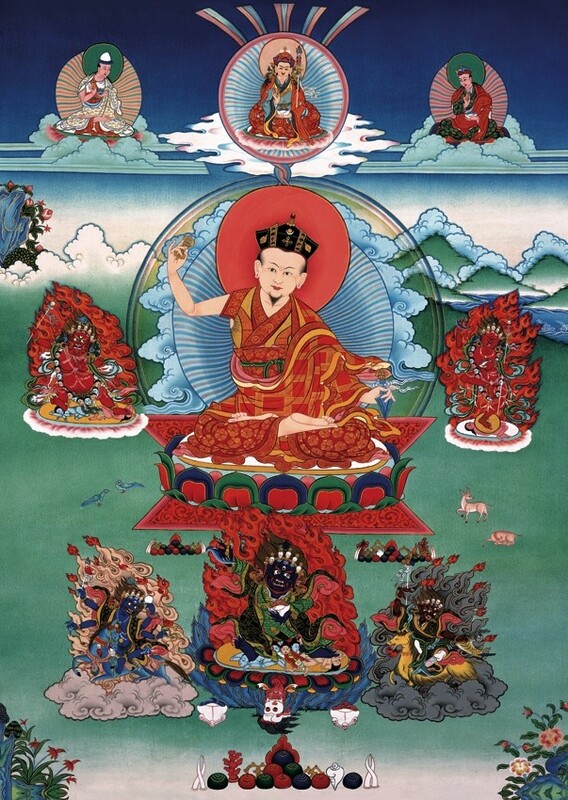 From this vision, Karma Pakshi transmitted to Mingyur Dorje all the instructions and blessings of this mandala’s practice – a type of “Meditation on the Lama” (Skt. Guru Yoga). Since then, the Karma Pakshi practice became very important to the Karma Kagyu lineage. In the painting above, Karmapa is shown in the centre of the mandala, surrounded by representations of the “Three Roots” – the Lamas (the root of blessing), the Yidams (the root of accomplishment) and the Protectors (the root of activity). As such, Karmapa embodies or unites these Three Roots. To “establish the mandala” of Karmapa means that we invoke – and then identify with – the Karmapa’s enlightened body, speech and mind. This is what happens in all the methods of Guru Yoga on the Karmapa, such as those associated with the 2nd, 8th, and 16th Karmapas. By opening up to the Karmapa as the essence of all Buddhas, we increasingly recognize the true nature of own awareness, and accomplish Buddhahood. Thank you ! great explanation. Great posts alltogehter. Would you be so kind in further expressing about what a Tertön is and does? How somebody becomes or is recognized a Tertön ? A tertön is an accomplished master holding an authentic lineage who successfully reveals hidden treasures (Tib. terma), concealed mainly by Padmasambhava and Yeshe Tsogyal, in full accordance with the prophesies made by Padmasambhava or a specific concealer of treasure-texts. The principle of Terma refers to the transmission through concealed treasures to be discovered at the proper time for the benefit of future disciples. It is one of the two chief traditions of the Nyingma School, the other being ‘Kama’. There are many types of terma, but the most common varieties are physically concealed treasure and mentally concealed treasure. Physically concealed treasure can include earth treasure, lake treasure, sky treasure, and more. Sometimes, for the sake of simplicity, they are all collectively called “Earth Treasure” (Tib. sa ter). These can include ritual objects, relics, other natural objects, and special scripts. These are often in the form of a yellow scroll on which are written a few syllables in symbolic “dakini script”. These letters can only be deciphered by the tertön to whom the legacy of the spiritual treasure belongs, and are unintelligible to anyone else. Mentally concealed or “Mind Treasure” (Tib. gong ter) refers to a revelation directly within the mind of a great master, without the need for a terma of material substance. The teachings revealed in this way were implanted within the mind stream at the time when the master in a former life was one of Padmasambhava’s disciples. One of the special requirements for the discovery of termas is the inspiration of the feminine principle, just as it was necessary for their concealment. The great majority of tertöns have been men, and generally they are accompanied by their wives or female companions.